Uniquely styled with fully bezel set diamonds, this elegant pendant has been precision set with G colour and SI1 clarity round brilliant diamonds. A modern two stone drop pendant with two Round Brilliant cut Diamonds in graduating sizes. 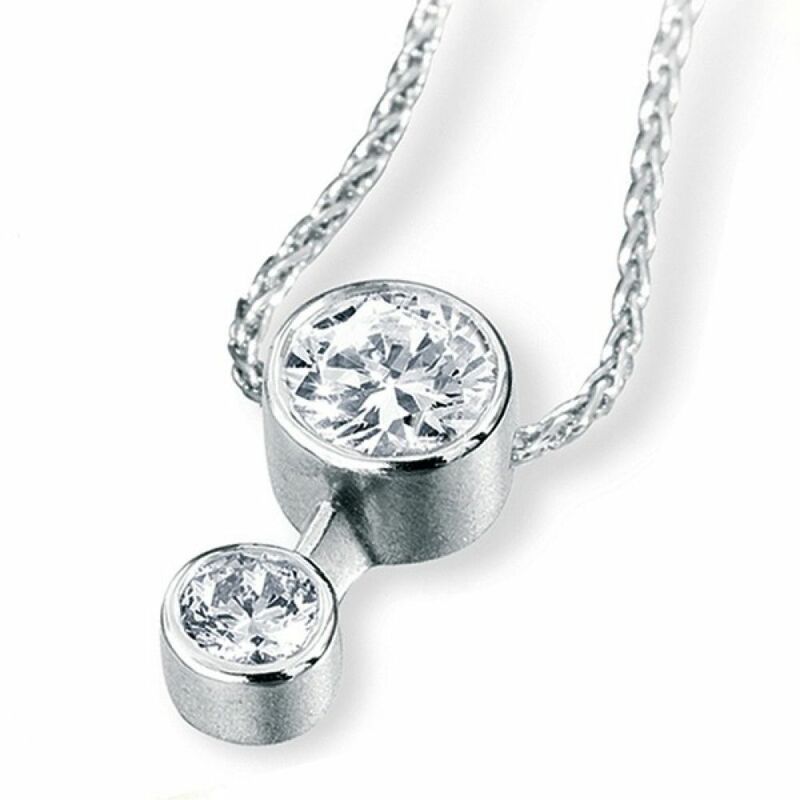 A full bezel setting is skilfully positioned and joined together with an elegant spacing bar allowing the pendant to seamlessly hang from the 18" curb chain and slider style fixing. The chain length will allow the pendant to rest elegantly on the chest bone, moving and shimmering in the light as the wearer moves. This graceful pendant comes complete with a matching 18" curb chain, available in various precious metal finishes including the 18 Carat Fairtrade Gold option which is fully traceable. The beautifully cut Diamonds are available in a total weight of either 0.30 or 0.60 carats and have been graded SI1 Clarity and G Colour prior to being expertly set. Please allow up to 4 weeks for delivery as each pendant is specifically crafted to order, it will then be delivered to your door beautifully presented, ready to be cherished and enjoyed for a lifetime.